Cristiano Ronaldo scored the deciding penalty in the shootout at the San Siro to win Real Madrid an eleventh Champions League, and elevate Zinedine Zidane to the pantheon of the six other coaches who have won the European Cup as both a player and a manager. A classic match, however, it most certainly was not, with both teams struggling in key areas of their game. Zidane’s starting XI was no real surprise. Pepe started in place of the injured Raphael Varane in an otherwise stable back four, Casemiro took up his position at the base of midfield, flanked by Luka Modric and Toni Kroos, while the famed trident of Gareth Bale, Karim Benzema and Cristiano Ronaldo took up the prime attacking responsibility for Real. Diego Simeone’s selection, however, was more intriguing. Stefan Savic was preferred in defence to Jose Gimenez, despite the Uruguayan starting in both legs of the semi-final against Bayern Munich. Augusto Fernandez partnered Gabi in midfield, with Koke and Saul on the right and left respectively. Meanwhile Antoine Griezmann played slightly behind local hero Fernando Torres up front. It has become impossible to discuss Real Madrid in a tactical sense this season without mentioning their struggles in possession. Much of Zidane’s job since he took the step up from Castilla has been to try to rectify the at times baffling positional structure implemented by his predecessor, Rafa Benitez. While it is perhaps harsh to criticise a relatively inexperienced coach for his inability to fix such deep-rooted flaws in a team’s possession play, the Frenchman’s team have, nonetheless, flattered to deceive in this aspect of their play. The problems are always the same. Too little space between players looking to penetrate the first line; too much space between the first line and the more advanced units in the team. It was not uncommon, also, to see all three of Real’s midfielders – Modric, Casemiro and Kroos – looking to receive the ball with the entirety of Atletico Madrid’s defensive block in front of them. Furthermore, the structure in these situations was invariably poor. A good positional structure is vital in achieving the balance between allowing for penetrative possession whilst constantly being prepared for the eventuality of a transition. The spacing of players should be sufficient enough that as much of the key areas of the pitch is efficiently occupied – thus forcing the opponent to shift as much as possible when circulating, testing them in their ability to keep compact whilst also dealing with the threat of players inside the block. Meanwhile, it must also not be so large as to result in passes which have to span great lengths. These passes, and their longer travel time, are more susceptible to being intercepted, which in turn deals considerable problems in terms of defending the transition. Real consistently failed to adhere to these fundamental guidelines of positional possession, with passing lines to key teammates threatened by opposition players, players looking to receive in positions which did not affect Atletico’s defence at all, and longer passing lines blocked by teammates – Xabi Alonso made it to the final in spirit at least. Real’s overload in the first progression is excessive, causing it to be counterproductive in the next phase of play. The players closest to the ball are under pressure from Atletico’s forwards, making them unsuitable to play to, and they’re also blocking passes to teammates in more suitable positions. Therefore Pepe is left with little choice but to play a hopeful aerial ball forwards, which Atleti recover with ease. In addition to the issues regarding spacing and structure, Real’s job was made even harder due to the number of players they committed in the build-up phase. As mentioned before, the midfield three were often very content to have the Atleti block in front of them. Kroos and Modric would often position themselves in their respective halfspaces, which offers the potential for some effective circulation, forcing the opposition’s block to make considerable shifts. However, since they were playing often on roughly the same line as Atletico’s first line of defence, their ability to affect the game was greatly diminished. Quite simply, although this gave Real a considerable numerical superiority in overcoming the first line of pressure, the use of so many players in the first progression meant that they were not in a position to be readily available in the subsequent phases. This left Bale, Benzema and Ronaldo to bear the load of consolidating possession between the three of them for the most part. As fine players as they are, this is definitely not the strongest part of any of their skillsets, and despite support from Marcelo and Dani Carvajal, led to them being isolated on many occasions. However, such conservatism in possession had the effect of greatly reducing Real’s susceptibility to counter attacks, simply through sheer weight of numbers. With Real failing miserably to maintain possession of the ball for any extended period of time, the onus was placed on Atletico to assume the role of the ball-dominating team. Simeone’s side struggled for large portions of the first half to gain any kind of inroad into Real’s defence. Real’s 3v2 in the centre of the pitch made it very difficult for Atleti to build through the centre, despite the excellent distribution of Gabi. Casemiro’s position-oriented defensive role at the base of Real’s midfield allowed Kroos to pick up and track Gabi when he himself wasn’t covering his position in the left halfspace. Although Fernandez sat slightly deeper of the two and thus avoided much attention from Modric, the passing option to his central midfield partner was mostly covered by Kroos, and thus there were few opportunities to consolidate possession in midfield. A temporary solution came in the form of Koke. The Atletico stalwart made runs into the centre of the pitch from his berth at left midfield, with some degree of success. Despite it seeming as though Real expected such a movement, with Modric tasked with the responsibility of tracking those runs – to some distance across the pitch on occasion – the tactic nonetheless provided Atleti with a platform in midfield from which to build attacks. Koke’s forays took him as far as the right halfspace, where he was able to disrupt Real’s defensive scheme at times by forcing Kroos to choose between picking up him, Gabi. or to keep his position, maintaining the compactness of the midfield. Atletico’s formation of a midfield three of their own through the inward movement of Koke had the dual effect of freeing up a midfielder from Real’s man-orientations, and isolating Casemiro – thus opening up at least one vertical passing lane. Fernandez in this instance plays to Griezmann, but a diagonal pass into the halfspace Kroos has vacated in order to track Koke’s movement could have been another option. The Rojiblancos’ performance was unconventional for reasons other than their unexpectedly high possession count, however. While the defensive system was nothing new, the implementation of it was very unlike what we have come to expect from Diego Simeone’s men. There were many aspects of it which were successful. 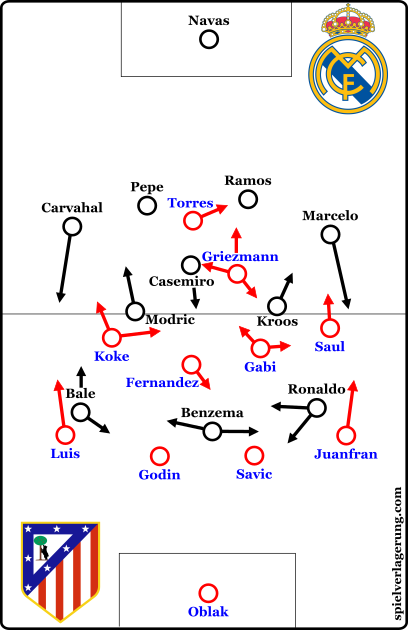 From the front, Torres and Griezmann managed to prevent Real’s central defenders from progressing the ball through the middle of the pitch – curving their runs astutely to keep Casemiro and Modric in particular in their cover shadow whilst pressing. 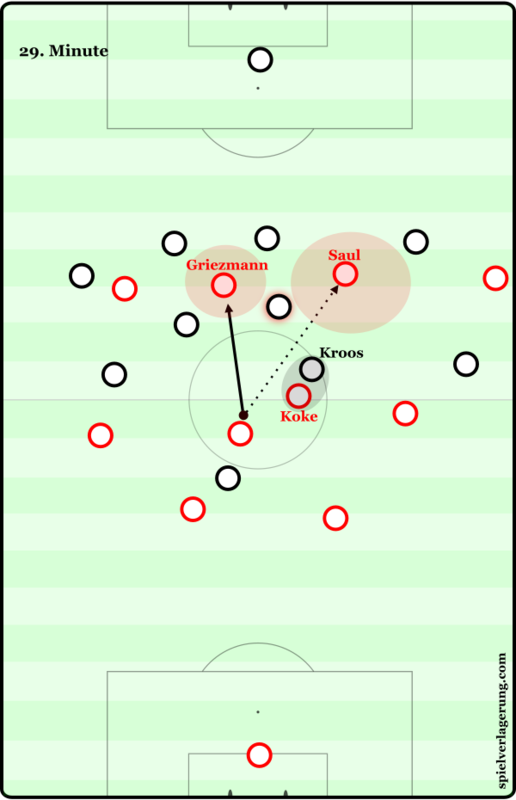 Having forced the centre backs to play wide to the full backs, Atleti then – as is customary – applied pressure through their wide midfielder, with the ball-near central midfielder providing cover. Though the distance between these two players was usually very tight, the distance between the ball-near and ball-far central midfielder would vary, as the far-side central midfielder would look to hold position centrally. By applying pressure on the ball against the touchline, and with either Felipe Luis on the left or Juanfran on the right defending very tight against whoever occupied Real’s right or left wing spots respectively, Atleti were able to force Real to play aimless, long passes on a number of occasions. However, despite these successes, Atletico defended with a lack of compactness and intensity, which caused them problems when facing a front three who are noted for their skill and speed. Perhaps feeling worried about the threat of Real using said searing pace to get behind them, Atleti’s backline would fall back at the earliest opportunity. This had the knock-on effect of leaving a sizeable space between them and the midfield, in which Real’s forward players could drop to easily receive the ball. Such space as well was a haven for Ronaldo, Bale, and to an extent Marcelo, to dribble into at speed. With an increase in space to deal with, the aggressive pressing which Atletico have become famous for in recent years was much more difficult to implement, since each sprint to press became longer, with more space left behind for the opposition to exploit. The start of the second half saw some changes which had a large effect on the game. Simeone changed to a 4-1-4-1 – Gabi playing as a pivot with Saul to his left and Koke now to his right, Griezmann moved to the right wing while his counterpart on the left was Yannick Carrasco, who replaced Augusto Fernandez at half time. The increase in Atletico’s pressing intensity was visible from the first few seconds of the second half. This approach bore fruit within a minute of the restart, as Ronaldo was forced to give up possession in his own half, Atleti proceeded to counter and won a penalty from a rash Pepe challenge. Although Griezmann smashed his penalty against the bar, the runners up from two years ago had set the tone for the rest of the half. Atletico were more proactive in every sense after the break. The introduction of Carrasco, coupled with Felipe Luis’ more aggressive play saw them try to exploit the space down Real’s right hand side, where Danilo had come on for the injured Carvajal. Carrasco’s ability to drive at the Real defence with pace, in particular, was key in the increased tempo shown by the Rojiblancos. With their midfield three, Atletico were able to control possession of the ball more. From a deeper and more central position, Gabi was able to pick out passes to the other two midfielders who looked to play between the lines – something which was not always possible in the first half. In doing so, and along with the much more frequent and aggressive supporting runs of Felipe Luis and Juanfran, they were consistently in a position to attack the Real defence directly, mostly down the flanks. The addition, also, of an extra man in midfield affected Atleti’s play out of possession. With better access to Real’s midfield three, they were able to apply more consistent pressure and in greater numbers than in the first half – which is of great importance when the opposing midfield contains players as press-resistant as Toni Kroos or Luka Modric. As Real looked to secure their lead, Zidane made changes of his own. Lucas Vasquez came on for Karim Benzema, while Isco replaced Toni Kroos – a puzzling move considering the German’s aforementioned resistance to mounting Atletico pressure. Isco did, however, aid Real’s play going forward, helping build connections between players in advanced areas of the pitch through his positioning and movement. One such moment led to one of the most dangerous moments in the game, as Bale was able to drive at the heart of Atletico’s defence, draw four players towards him, leaving Ronaldo free in front of the goal from 9 yards out, forcing a great save from Oblak and an even better block from Saul to deny Bale on the follow up. With Real squandering their finest chance, it was then Atletico’s turn. The goal came from a forward run from Juanfran – unchecked by Ronaldo, Isco or Marcelo – who was found masterfully by Gabi, before firing a pass across the box to an awaiting Carrasco. Having restored parity, Simeone turned once more to his 4-4-2, and the game petered out – players on both teams drained by the intensity of their play and the Italian heat. In the end Cristiano Ronaldo proved to be the hero in a game he barely affected in open play. In a way, the oddity of that fact was reflected throughout the match. Atletico Madrid’s performance was remarkably un-Atletico-like, from their lethargic performance in the first half, to their surprisingly balanced and controlled possession play in the second. Their rivals were no different. Real Madrid are by no means a club synonymous with a passive approach, and yet it was exactly that which brought them their eleventh European Cup, and their second in three years. it would be interesting to watch again AM-RM autumn match. I think theory of RM deep-defending was Rafa’ idea, for example then Casemiro was (also) a defensive midfilder, when RM scored a quick goal RM also stood back deeply. difference: one of problems was that both of wingers (CR7 & Bale) didnt return to help – but they did with/for 😛 ZZ in CL final. 4-5-1 (defending) and 4-3-3 (attacking) can work but it takes a lot of energy from wingers. ZZ developed, re-organized Rafa’s tactic and made better. A significant part missed here in terms of how Athleti consistently played deliberate balls behind the ( very high) Real full backs and this significantly changed the balance of the game and fundamentally forced Real to adjust and play deeper than they would have wished. The Substitution of Toni proved to be an error which allowed Athleti to dominate the midfield and possession in second 45mins. Could you explain the arrows to the starting formation? Are the the constant movements throughout the game? Yeah. The arrows indicate the main directions of movement during the game. At least until the managers change tactics or players.